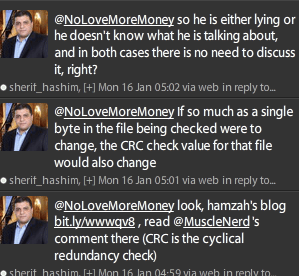 Hamzah Akram is a fake…says @Musclenerd in his blog comments. We too have been following @Hamzah_akram closely on twitter, and he may be a faker trying to get some publicity. He hasn’t posted any video as the proof yet, and is now asking for help from @chpwn, @Sherif_hashim and many other for help packaging the app for unlock. According to him, nobody is helping him out. However, we did saw some fellow tweeps offered him some help but he never replied. On the other hand, @Sherif_Hashim is working on 04.11.08 unlock. He doesn’t have an exploit till now (or he hasn’t announced it yet), but still working hard for the same. We are also waiting for the new gevey sim for 04.11.08. technoNix.com would be updated as soon as there is any new unlock available. For more such updates on iPhone jailbreaking and unlocking, subscribe to technoNix via email, Follow @technoNix on Twitter or connect with us via our facebook fan page. When do you think there could be a software/ hardware Unlock for BB 04.11.08? Any estimates ? Thanks for the comment. Maybe till February end. Will update technoNix.com as soon as it is out. Do Keep visitng the site! Hamzah Akram = marka Hazmah – it is another spam guy to full the community.